There was one of those Columbian Expo Shield plaques as lot 490 in the 12/2003 Presidential sale. It sold for $6,500 + 15%. I saw a second one in a local auction a few years later. I don't remember the exact details, but it sold for a similar amount, maybe $5,000 or so. FWIW, these shields are *big* -- three FEET tall and almost as wide. The size doesn't really sink in until you see one in person. 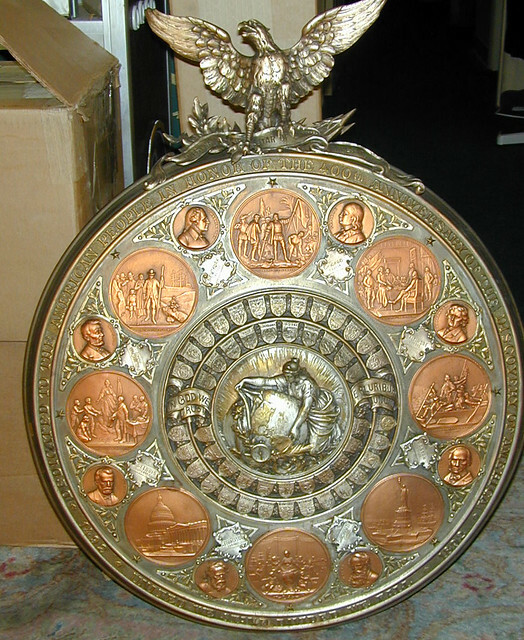 SPECTACULAR 'COLUMBIA SHIELD', 1892. 28” Diameter, height with eagle, 36”. Brass with bronzed insets. Extremely Fine. The displayed eagle is perched on a ribbon inscribed: WESTWARD THE STAR OF EMPIRE TAKES ITS WAY. The legend around the shield reads; * DEDICATED TO THE AMERICAN PEOPLE IN HONOR OF THE 400TH ANNIVERSARY OF THE DISCOVERY OF AMERICA * 1492 UNITED WE STAND DIVIDED WE FALL * 1892. At center is a very high relief roundel in aluminum, lightly gilded, of an allegory of Columbia uncovering the Western Hemisphere of the World. It is surrounded by the silvered coat of arms of every State in the Union at that time. To either side are the inscriptions, IN GOD WE TRUST and E. PLURIBUS UNUM. Surrounding the central portion are eight 115mm. bronze colored medallions illustrating some of the most important events and monuments in American history, starting with: (1) Landing of Columbus; (2).Landing of the Pilgrims; (3). Signing of the Declaration of Independence; (4). Washington crossing the Delaware; (5). Lincoln Emancipating the slaves; (6). A view of the Capitol Building at Washington, D.C.; (7). A view of the Statue of Liberty; and (8). An allegory show the Progress of industry, Commerce, etc. under the protection of Columbia. Interspersed between the large medallions are 8 smaller 58mm bronzed medals each exhibiting the likeness of the following illustrious American citizens; Washington, Jefferson, Franklin, Lincoln, Grant, Clay, Longfellow and Morse. below the portrait are the names of the eight largest American cities and their current populations. The idea of the Columbia Shield was conceived and carried into effect by Heeren Bros. and Co. of Pittsburgh who had it produced in Germany. It was intended as a commercial product, and the first shield produced and finished was presented to President Cleveland in the White House. The Columbia Shield is, simply stated, the most spectacular medallic exposition item this writer has ever seen! Its sheer size is enough to command respect and attention and the skillfulness and artistry with which it honors the 400th anniversary of the discovery of America makes it into a real museum piece.